It's tempting to believe that with smartphones in every pocket, consumers are relying on lightning-fast access to information at their fingertips instead of resorting to brand loyalty. Connected consumers are quicker to compare products, but does the simple fact of access to information affect buying decisions as much as we think it does? Not necessarily. How do I know? I cut through the case studies and looked at ten years worth of data. Data from over 6,000 mergers and acquisitions between 2003 and 2013 shows us valuation trends over the decade. Pulling data from the Markables database shows us the dollar valuation of a company's assets, which include the trademarks and customer relationships—an ideal data set to provide answers for those hypothesizing marketers. 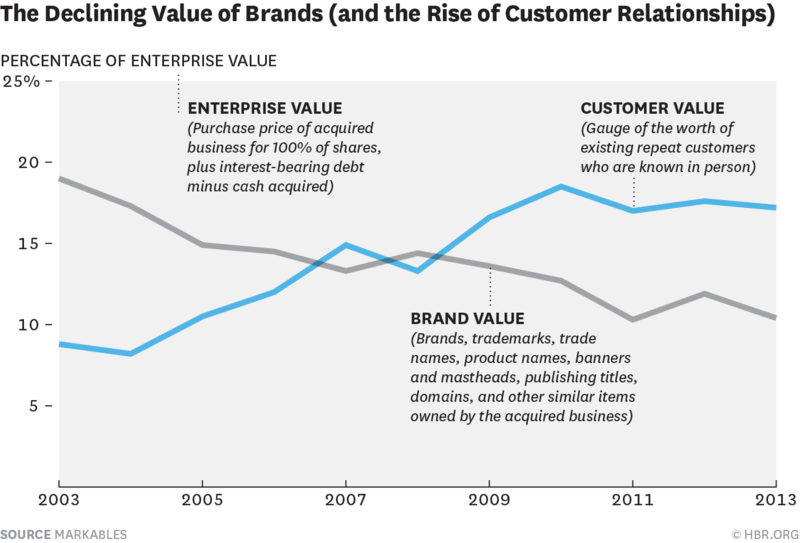 An analysis by the Harvard Business Review showed that over ten years the trend lines are clear: brand valuations declined while customer relationship values rose. So it's less about whether customers can or will sift through information to make (or not make) decisions about brand purchases—it's about whether or not you have a relationship with them. That relationship is quite literally more valuable than your brand. Luckily, marketing technology now allows brands to optimize the consumer's journey and leverage effective communications. Preference management, the active collection, maintenance and distribution of unique consumer characteristics, such as product interest, communication channel preference and frequency of communication is the best way to engage with customers and ensure that they are leading that relationship on their own terms. When they have an affinity for the brand, it's due to their personal relationship with it, not necessarily the research and development behind the product. 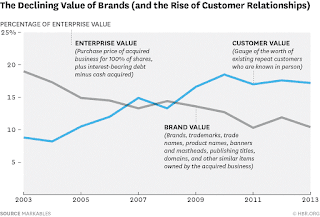 Think about how your company would be valued—are relationships with your clients worth double your brand? Investing in those relationships now has an increased ROI for your company as a whole.